As soon as the credits hit the screen, I knew I had loved what I had seen. Actually I knew it the entire time I watched it. Horror is a genre that I don't easily warm up to and the trailers before the film were a perfect representation of why. So predictable, so obvious, all the expected tropes of generic cheap cinema scares that have no trouble selling tickets at the box office and yet they do so little to truly inspire. It Follows is different though. 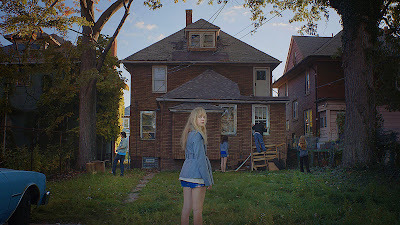 It Follows is special, a film released in 2015 and yet it invoked a feeling of nostalgia in me, as if it were released 30 years earlier, the type of movie I would have watched late at night with friends as a teen. I drive home from the theater feeling buzzed, replaying my favorite scenes in my head over and over, pondering some of the subtle nuances of the movie that made It Follows a far richer cinematic experience than what was merely presented on the surface. My car comes to a stop along the way and I glance over at a man on the sidewalk, walking slowly, shrouded in darkness. The chill of the nighttime air flows through the windows and I recognize the goosebumps that covered my arms. In that moment everything was normal, yet it felt anything but. I make the same turn into my driveway that I make every single day and my headlights make shadows dance across the neighboring homes. My heart literally skips a beat and I momentarily am engulfed with a feeling of dread as I see a man standing just off to the side. A closer look reveals there is no man there at all, but what did I see? Were my eyes merely playing a trick on me? Yeah, that's probably it. I remind myself that there is nothing to worry about, yet I have an extra bounce in my step as I head up the stairs and through my front door. I sit here now, writing these words and I can't get the score by Disasterpeace out of my mind. So damn perfect for the material, at times it felt as if it was already iconic, like it was destined to send chills down the spines of viewers for many years to come. I can't stop thinking about the confident, stylish direction by David Robert Mitchell, especially a few specific sequences in which his camera turns slowly and with ease, at a perfect pace and rhythm to make your heart race just a few beats faster, make you wonder what will be waiting for you when it comes full circle. I can't stop thinking about the look of sheer terror in the eyes of star Maika Monroe as she saw something others could not, the way she trembled at the sight of something as seemingly innocent as an open door. Great review, Scott. I really want to see it. I love how you showed the way the film affected your mind afterward. Great. Thanks Francene! I really appreciate that, a lot. Thank you so much for reading.